Plug in, charge up, and get synched all at once with this combination cradle and battery charger that works with the A/C adapter from the iPAQ h2200 box. Made of quality 900 mAh Lithium-Ion, this battery will keep your iPAQ h2200 series handheld up and running during important meetings and on lengthy flights. 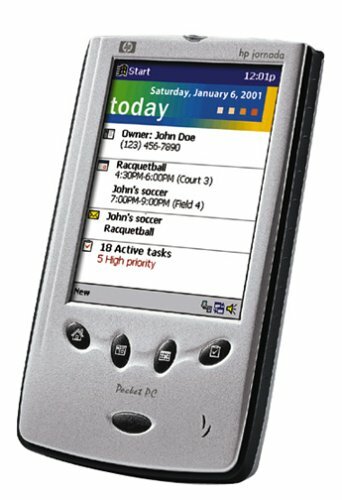 Recharge either in your iPAQ on in the cradle. Attach this remarkably small, lightweight keyboard to your iPAQ Pocket PC h2200 or h4100 series model for easy QWERTY thumb key data entry. Thumbs up H2200 Micro keyboard! I really like this keyboard, very useful since I don't like to use the Grafitti text input method because I think that I'll scratch my screen (I really take a lot of care to not scratch my screen). I own the Ipaq 4155. I am using this keyboard to write this review. Set up was so simple and the layout is easy to learn. I used this keyboard to send an e-mail within 10 minutes. Much much faster than block reckognizer. I had planned on purchasing this keyboard when I first got my 4155 but delayed a coulple monthsand just used block reckognizer. How sorry I am that I waited. I write more e-mail and take more notes now. This is a must have accessory. I purchased this keyboard to be used with my iPAQ 3835.I've had this keyboard for almost two months and it has worked very well--the keys are easy to press, typing speed increases as you get more used to it, and it does not add too much more to the length and thickness of the unit. Using the numeric keys takes a little to get used to, as the num-lock key needs to be enabled and sometimes it's easy to forget to unlock it since there is no on-screen indicator.All the numbers are on the top row of the keyboard and are not laid out in a "numeric keyboard" layout.Also, for those who have previously used the Targus keyboard with their iPAQs, you need to uninstall the Targus software to allow this keyboard to work--hence, you will be unable to use your old keyboard.An added plus is that the keys and the hot-keys will not turn on your iPAQ directly, preventing accidental use. Also, I use the pharos GPS system and the software of the keyboard also messes with the GPS software--you would need to shut off the keyboard, then do a soft-reset prior to using the GPS device. 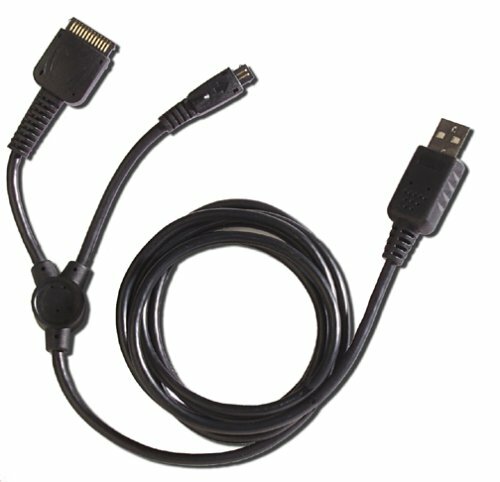 Overall, this is an excellent piece of hardware for the iPAQ, it substitutes well for the on-screen input methods in accuracy and allows for quicker input.I would have given it 5 stars if it did not conflict with the other software programs--something that should have been considered, especially coming from HP. I recently picked up an Ipaq 4155 and this keyboard to go along with it.I chose this over the 4355 with the built-in keyboard since the 4355 is just too large to carry around all the time. The keyboard is as small as possible while still being easy to use, and it weighs almost nothing.Driver installation was a snap.I've had no problems with it so far. If you are like me and could use a keyboard for your iPaq sometimes, but not all the time, go for this with the 4155 over the 4355.If you will need it the majority of the time and you dont mind the additional size, the 4355 may be a better match for you.Of course if you need a keyboard for the 2200 series this is also the way to go. After reading some reviews I was concerned that this product would not work as advertised, but I am here to tell you that this product works very well! I have a HP Omnibook 4150 and jornada 560, I do hate traveling with the original charger and cradle, I was excited finding a single lightweight cable that do both functions, but before I purchase it, I read all the customer reviews and I found strange the Amazon's...product review explaining that the cable simply does not work until he received two more from iConcepts support with different configurations. Any way I decided to buy it and guess what?... it charges the PDA but does not sync!, it is recognized when it is plugged between PC and PDA but just in the minute you expect to see files synchronizing it appears a "No connected" window. 1) The cable can't support the bandwidth required to do sync. 2) The connector pins are slightly shorter that the hp cradle so maybe one of those are not making contact with the PDA. ...the solution was different!, I noticed that the USB connector in the plastic part was thicker than others, that avoid the cable to go all the way in, causing the "no conection messagge" so I handmade cut the plastic connector of the USB side, in order to the metallic conector and pins are longer like 1/8 inch and the cable works excelent!!! thats why I give 4 stars. This cable is a great portable alternative to the hot-sync cradle that comes with the Jornada, which tends to be bulky and difficult to carry. 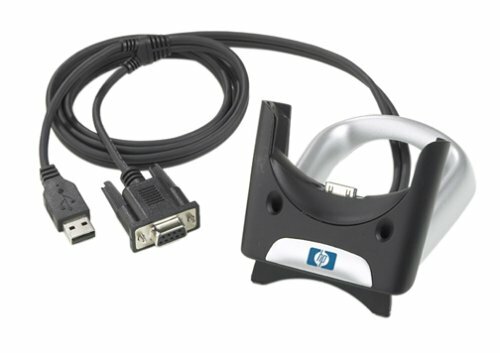 And while it functions just like the cradle, it allows you to charge your PDA directly from the computer/lap-top's USB port. However, there is one shortcoming. Obviously, the level of power that the USB port provides is much less than that of a regular wall outlet. Consequently, charging time is greatly increased. because of this, I would only recommend the cable for travel when you can't bring the hotsync along. It was easy to use and charged my HP Joranda 540 handheld. Enough to last all day! Ok, so the specs for this case are wrong.There's no place to put a credit card.Still, it's a good, slim case.For people on the move, who don't need to carry anything more than a few SD cards for their PDA, this is probably the best case you can buy. I especially like the attached metal belt clip.Once you put it on, it's not going anywhere.I can't handle those flimsy detachable belt clips that most cases have... they don't clip on as securely, and break off too easily. I decided to buy this case because it was made by HP. You would figure who would know better than the manufacturer itself on how to make a case for it's own products. This case fits my IPAQ 1935 (1900 series) snugly and perfectly. It's very secure and I don't worry about the Ipaq ever falling out. It also leaves space open at tops to plug in earphones while the case is closed. The leather is sturdy and soft - looks very elegant and professional. However unless you are buying form over function, my biggest complaint is that I constantly have to remove the IPAQ from the case to use it. The trifold does not allow you to access the IPAQ while it is within the case, you have to take it out to use it which is annoying because what do you do with the case when you are holding the IPAQ? I just got this unit for $249.00 on sale.It works fantastic.Most complaints I have heard have to do with user error and not getting the apporpriate updates.Works like a dream, I recommend it highly. This PDA case is almost perfect.I have found it to be durable and effective at protecting my Palm from harm.The bright color makes my Palm easy to find on my cluttered desk.If the case had pockets for expansion cards and so forth, it would be perfect! This case is much too big for Palm Zire, and also cheap looking.I don't like it at all and will not use it. Simply, this is a PDA case, and functions just fine as one. Obviously it is larger than your PDA by a bit, as it must protect it, fairly slim, though. Zipper operates smoothly, and the padding works well, protects nicely. The interior velcro will hold the PDA well, but I am not sure what the elastic is for, possibly a pen, but certainly not your stylus. That's about it. A good case for the price. 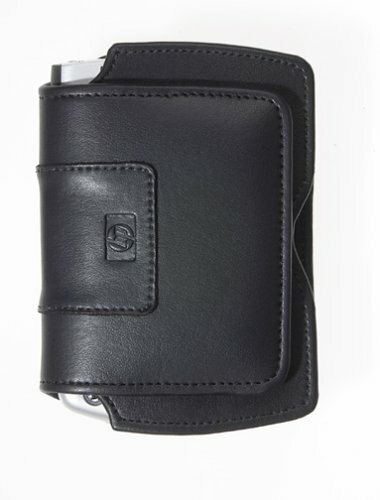 This is a very nice looking wallet for PDA's, but is too big for the Palm m130. This Pocket PC holder is just right in size.I orignally purchased the travel size pocket PC holder from Fellowes and it just didn't cut it.It was too big and bulky without the capacity to justify the size.This one is smallenough to drop in your purse or briefcase. 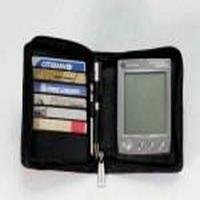 This is one of the few Pocket PC holders that had a spot both for the stylus and a pen and a spot for a pad of paper. It seems odd with all the capacity of a Pocket PC to want a pad of paper, but hey, try to leave a note for someone with just a Pocket PC in hand.Hence my wanting paper and pen at hand too. Also, under where the pad of paper fits and is provided, you can put credit or business cards.There is no wasted space. This handheld Pocket PC case is expensive looking and feeling, with a plastic zipper that has a large metal tang that is easy to grasp.The plastic zipper is desirable as many Pocket PC owners complained of the metal zippers damaging the finish on their devices. The large metal zipper pull makes it easy to close up quickly. This is the best mix of size and capacity I have seen on the market for the Pocket PC, and I've looked at them all.The price is right too. Keeps your palm and other stuff too! As far as getting this card to work with my PDA, this card was certainly the easiest.I also bought an AmbiCom BT2000 card, and with that card I couldn't get my PDA to connect to my phone.It was very nice, just didn't work with my PDA well.After that experience, this took me 10 minutes. Important added bonus - this is the least obnoxious card out there.It's so small that it does not stick out of the slot, which prevents it from being seen and/or damaged.Blinking lights on your card are overrated! I'm using an Audiovox Maestro with the Socket card + an Ericsson T68 cell phone. I don't know what the complaints are about, it works like a charm. I keep the phone in my pocket and web-browse using my PDA, or I can synch them wirelessly. 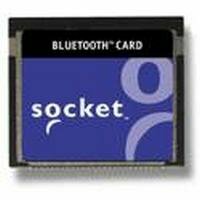 Setup was a complete breeze, the current Socket software for handhelds walks you through the process. I can't imagine this being any easier, and I'm shocked by the other comments. Maybe their beta software sucked, but the release versions are wizard-driven and simple. Portable and effective, could use some improvement. There are a few annoying things with this unit.It doesn't always connect when it should, but resetting the Jornada makes the connection work.It certainly isn't as fast as I would like, average speed of 14.4. 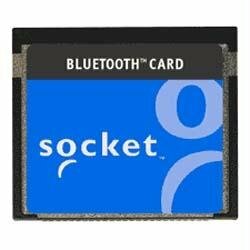 All in all, the portability and functionality makes this a great buy.If you have the bluetooth kit and a pocket PC, this is a must have; at least until the next level improved modem comes along! Tired of searching for your stylus? Lost the original stylus already? 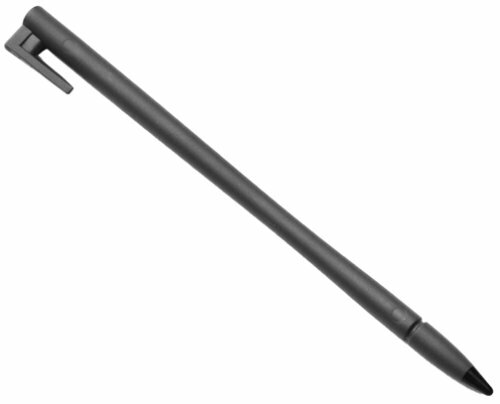 Keep extra styli at home, at the office, in the car or wherever you use your PDA. Just as extra pens are handy when you're writing and run out of ink or lose the pen, extra styli are critical when you're iPAQing. Keep scratches off your screen with these three lightweight replacement pens for the h2200 series. I find it hard to review this product since I bought a new one online (not Amazon) and the ostia software was not in it. The company does not back their product.They would not help me in no way.I do not like sending business to a company that does not look out for their customers.I don't think Pharos is a company anyone should buy from.I am on disability and have memory problems if anyone has any suggestions please let me know. I have a 3900 series IPAQ and installed the software per the instructions.First problem, I could not open more than three maps at one time even though the book says ten.Second problem, there are gaps between the maps.I tried to have it plot me a trip from Atlanta, GA to Pensacola, FL.This is a straight-forward trip, but because of missing sections between the maps, it could not.Third problem, every second or third time I powered down the PDA when stopping for gas, I had to do a soft-reset to get the thing working at all.The system had no problems reconnecting to the GPS signal(s) during gas stops, except for these lockups, it usually took 30 to 45 seconds.Maps were accurate along the route, where maps were available.I found no updates available online to fix these problems.For around town I think it works great, but for any kind of distance, I would look into a different solution/product. Easy to Install/Use, latest software very good. The unit installed very easily. The 12v connector worked very well and did not disconnect. Both the gps unit and the pda were powered from the 12v connection. The software loaded easily on the laptop and transferred to the iPAQ with no problems. The maps require a little forethought. However, loadiing all of the state of Indiana still left lots of room on an SD card for other things. The system takes about 90 seconds to acquire satellites and then routes very well. Have only used it for local routing, but that is where I would need help most anyway. I already know how to use the interstates to get from one large metropolitan area to another (i.e. Chicago to Cleveland is relatively easy get on the interstate and stay on it). Sometimes it tells you about an exit just a little to close to the ramp. The voice prompts are very helpful. 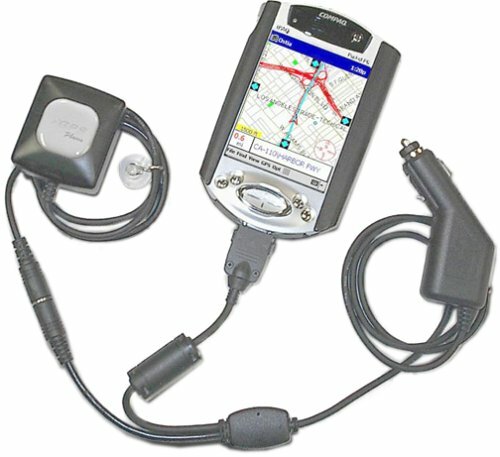 The Pharos GPS for iPAQ has the potential to be a good product, but the current version has some some definate challenges.The Ostia mapping sodfware is fairly easy and frindly to use, but that's where its good points end.The routing is not very intuitive.For example a simple direct route between two large cities connected by an interstate would not route that way.Instead the route has you getting on and off the interstate onto US or state roads several times.Presumably it is a shorter distance that way.I was told that version 4.01 corrects this and was offered a "Free*" upgrade. (*just my opinion, but when you pay for a product that is outdated when you get it, I just don't see is as you doing me any special favor by giving me a "free" upgrade).Well, anyway the upgrade did have an option to stick to highways but it didn't work, the software still routed me the same way.The software decides the best way to get from point A to point C, not you.You can't go via point B.The next issue was the hardware.The cigarette lighter plug would not maintain a connection and any time there was a power loss the GPS signal would be lost.The GPS signal itself was hard to get and hard to keep.I finally determined after much trial and error and frustration that the problem was the connector between the cable and the GPS antenna.I contacted Pharos Tech support via email and received no reply.I called and explained all the problems and requested a new cable.They would not do that, and insisted I send the cable for testing.Not wanting to be down, I requested Pharos ship me a new cable first that I would pay for then they could issue me a credit once they received the old cable and determined it was bad.They would not do that either.The only way they would work with me was for me to send them the cable for them to test and return within 2 days.I did.Three weeks later I got my old cable back, no explaination, no repair, just a box with a cable.Still didn't work. I have owned the Ipaq 5555 for a year.My review is far from positive. The unit has glitzy features but many disappointments.Battery life is not long enough for practical professional use. Handwriting recognition is about 90% at best and usually less.The unit has a slippery exterior that should be kept in a case; a poor engineering design , unless they want one to drop it. What is most disappointing is the one year warrantee support from HP.I developed synching problems. HP support put me through a variety of time consuming phone support resets et al.Finally they agreed (reluctantly) to accept the unit for analysis. We sent it in. The J2 connector on the main board was cracked.Despite a lack of any signs or history of external abuse, they claimed the unit must have been dropped and sustained significant impact.They are not planning to honor the warrantee.I am the only one who uses this unit. HP does not honor their warrantee.I would not recommend purchasing this unit. Other limitations are common to most PDAs.Slow compared to PCs, laptops, tablets.Poor screen size for internet. For the price this is not worth it. On the positive side the security features were valuable to me as a physician to protect confidential patient information.Otherwise it had little special to offer over units costing a fraction of the price. Wireless internet was of little value due to the slowness of connecting and unreliability of auto connecting.Within my own home I could walk downstairs to use the PC to access and get internet info more expediently. The only time it helped was on the road, and that was limited. Email access from the PDA is not happening for me. Many programs have to be purchased for PDA use that would be built in to most laptops and other PCs. Bluetooth devices are too pricey to be a good value. I think PDAs are great for storing contact info and making notes, but should not be pushed into the realm of truer computing.They should be easily held and capable of sustaining 4 foot falls. Again, I would specifically avoid the HP products because they are not honoring their warrantee, using flimsy evidence to shift the blame off their poor engineering of a handheld onto the user. Get a far less expensive Palm for basic contact and calendar use, a laptop or tablet for on the road computing and bypass these expensive and impractical Ipaqs. Avoid this PPC until they make one that is suitable for everyday use. This must be the most frustrating device it has ever been my misfortune to own! With some regularity, and with no apparent reason, it resets itself to factory settings. I spend more time restoring and reinstalling than I actually spend productively. At least 5-6 times per day, I have to do a soft reset because the thing locks up. Half the time it won't connect or sync either via USB or wireless. 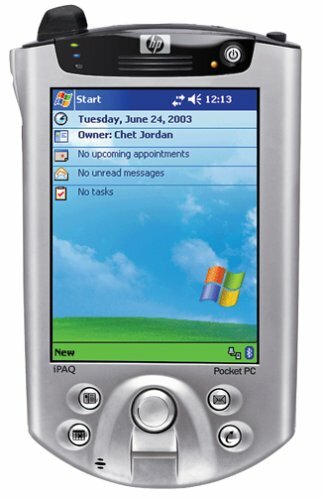 I've had the iPAQ for a year now, and am just getting ready to do a complete reinstall. Once again, it reset itself. Two weeks ago, same thing. This is the last time, however, there is a hammer in the iPAQ's future. I mean it. Afterthought: who ever heard of a device that can't be turned off? What numbskull designed a computer that loses everything if it loses power? Duh. To get absolute use out of this machine I would recommend the SanDisk 1 gig memory (inserts in topof 5555 easily .. about 300 bucks), Pocket map navigator (absolutely wonderful about 350 bucks) Sierra wireless aircard750 (so you can use it as a cell)and Microsoft voice recognition (works great) so you can select and play your tunes.This is a brilliantly designed machine..more usability just keeps popping out of it every day. One fair warning.. it's hell to learn to run correctly. The documentation is terrible but tech support has been patient during my dozen or so phone calls for help. I have dropped this machine and it still works so it is durable. The 5555 makes all other PDA's look like junk once you are on top of it. Forget the expense.. just buy it, fight it and make it work to do the things you want it to do. Oh, and download the software so you can watch movies on it too (another 50 bucks). You can put about 8 movies on the san disk. Don't waste money with the double expansion pack, get the single, it will still fit in your shirt pocket and do all the above. 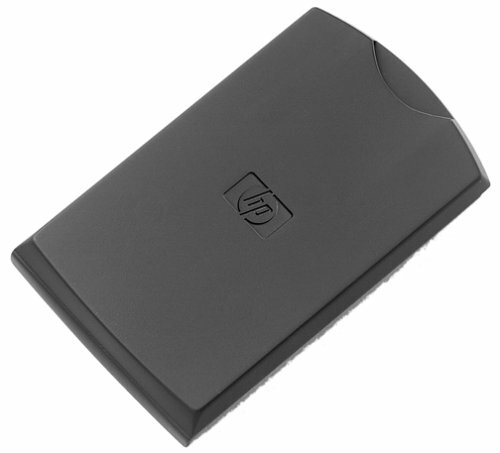 "The problem that has plagued HP since the 3000 series started is the battery. It isn't replaceable by any part that you can get your hands on, and it has a shelf life of about 1.5 years." 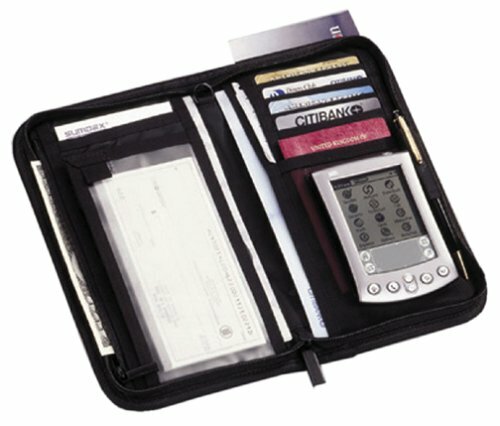 Ever since changing from a paper planner to a PDA, I'd been scouring the web for a cool case to carry it in. I found one I liked pretty well, it had room for credit cards and my palm but not really anyplace to store cash.Okay, if you wadded the bills up carefully they could go in this one pocket, but because they were folded a couple of times this quickly got bulky and besides, there was still no where to put my change. So I'd wind up carrying my pda case inside a purse, so I could still have access to my wallet and checkbook.There went the convenience of having such a small and smart planner-- with the purse I was carrying around something bigger and bulkier than my old paper planner! I was very excited when I finally came across this item at Amazon. It's got room for almost everything, plenty of pockets to put things in, lots of credit card slots and a nice, big zippered compartment behind the checkbook holder that was perfect for un-folded bills and even spare change!It's all in a sturdy backpack-like material and closes smartly with a zipper.What more could a girl ask for? Just one thing.It needs to have some sort of a pocket on the outside for my cell phone, and then it will truely have everything on my wish list.For now, I am clipping my phone to the outside flat pocket, but I'd like something that protects the face of my phone better, and it makes me nervous to rely soley on the clip for the safety of my phone.